We have so much to offer our members here at Steel Fitness Riverport, including a variety of classes that can help you reach your goals. Whether you want to build strength, get more athletic, or shed some pounds, we can help you get there in a fun, supportive environment. For some, classes are the main reason they come here. Trainer Brian Pedersen recently spoke with one of our members, Delia Chatlani, about why she enjoys Steel Fitness. 1.) What do you like best about being a member of Steel Fitness? How long have you been a member? What do you think sets us apart from other clubs? I joined Steel Fitness Riverport on June 15th of this year. I wanted to go to a gym that was close to my home and, most importantly that offers good group classes. I find it more stimulating to be working out with others, as a group, and under the guidance of an instructor. I would say that the classes that the gym offers are the main reasons why I choose this gym. The guidance of the instructors, the pace, and the entire routine makes it easy for me to simply get lost in executing the exercise and take a mental break from the day to day routine. Another very important aspect is being part of a community of people. I love coming to the gym and seeing the familiar faces of the people that enjoy the same classes as I do. 2.) What are some of your favorite classes? Why? My favorite class is the TRX class. I also enjoy the CLIMB, Steel Strength, and Thread and Shed classes. I like each of them for different reasons and I believe that the combination of them helps me progress in my objective, which is to have a healthy and strong body. My perception is that a TRX class allows you to reach and work on specific muscles in a correct way and with little risk for injury. The running class (Thread and Shed) not only has a positive effect on my body, but it does wonders for my mind too. It also helps me build the endurance that I need for other gym exercises. Very important as well, are the CLIMB and Steel Strength classes that add the weight lifting component to my workouts and help me make significant progress. 3.) If there was one thing we could do to make us even more awesome, what would it be? For me that would be a kickboxing class, on Thursday at 5.30 pm to be very precise 🙂 I have done kickboxing classes before and I believe that for me that would be the perfect addition to my routine. 4.) Is there a specific aspect of your fitness that either a trainer, instructor or a class has helped you improve? Yes, I think that the TRX class is great. In addition to what I have already mentioned above, I believe that the TRX class is the kind of class that helps you build strength and balance at the same time. 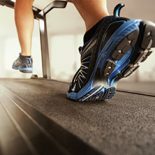 The pace of the exercise is slow (compared to a cardio class, for example) and you can choose the intensity of the exercise. You can make it more or less challenging for yourself and that makes it a great exercise for all levels. Check back on our blog next time for more stories, tips, advice, and news!